MORAGA, Calif. -- The girls sit on the large expanse of lawn in front of the church at St. Mary's College, and they can't help but pick at the grass and twist the bright green blades around in their fingers. Grass. The soccer fields at home don't look like this. The 12 girls who arrived at San Francisco International Airport two weekends ago flew more than 20 hours and changed planes three times to be at Julie Foudy's Leadership Camp. Some of their friends were left behind at home in Mumbai, India, because of passport issues. They almost didn't get to make the trip themselves. A terrorist bombing on July 13 and an airline strike put their journey in jeopardy more than once. But in the end, the girls, who range in age from 14 to 17, and their coaches landed in the United States, ready for what appropriately can be described as the adventure of their lives. None of the 12 had ever been out of India. Some had never left their communities, in the slums of Mumbai, the same areas featured in the movie "Slumdog Millionaire." Because it's monsoon season in India, the dirt field they normally play and practice on is a muddy mess. Because girls playing soccer is a relatively new -- and not entirely accepted -- concept in India, they play a limited schedule, maybe two or three tournaments a year. They'd never seen anything like the bucolic, tree-filled campus at St. Mary's, where more than 100 girls are spending the week mastering soccer drills and lessons about life and leadership from Foudy, the former U.S. national team captain, and her staff. On the bus ride from the airport to the campus, the girls wanted to know, "Where are the slums?" "It's something we have only read about in books, it's not anything I thought I would see," said 16-year-old Supriya Suresh Jadhav, speaking through an interpreter. "When we first came here, we said how clean it is," said 16-year-old Nagma Shaikh. "It's much different." But the Magic Bus girls -- the group is named for the Mumbai-based nonprofit program that sponsors youth sports teams and leagues throughout India -- are teaching some lessons, as well. "I feel like I want to be like them, just as courageous and just as brave," said 14-year-old Amanda Giles, who lives in nearby Moraga. "We've been so inspired by them. For the first couple of days, we were learning how to communicate with them through the translator. Now we are learning words in their language. They are teaching us words and songs. We've all had a great time." This trip to America is a fantasy come true for the Magic Bus girls. The reality of their lives back home in India is considerably more stark. They live in one of the most densely populated cities in the world, occupying close, spartan living quarters, often without clean water. They work to help support their families, and some will face the prospect of marriage before many of their American counterparts will graduate from high school. By U.S. standards, these girls live in squalor. But it is all they've known until now. They stepped off the bus in Moraga, greeted by Foudy and her staff, with huge smiles. "These girls have never been away from their homes, some of them have never been out of the slums, and they got on a plane and they are experiencing a culture they've never seen and food they've never eaten," Foudy said. "It's a tremendous thing. I just think of the strength of it. They are willing to try new things. It's brave." The first night the girls spent in their dorm room was both short and sweet. Carolyn Conforti, the camp's curriculum director, could hear the girls upstairs at 4:45 a.m. moving around. "It sounded like 'Riverdance' up there," Conforti said. "I was prepared to go up there and talk to them sternly and tell them to quiet down." But when Conforti knocked on the door and opened it, they were all standing there, fully dressed in their green and yellow Magic Bus uniforms, grinning. "They were like a little flock of birds with these big smiles," Conforti said. "They have such great energy." Foudy has arranged for the chef in the dining hall to make Indian food one night for the girls. Magic Bus helped to arrange a Skype call home to India, so their parents could see that they were doing well. 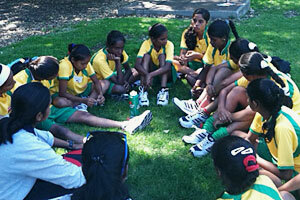 The Mumbai girls, as they are being called at camp, have been divided up among different teams in the camp, mixing and mingling with the other campers. 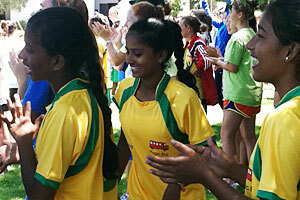 At team-building exercises, despite some language barriers, the girls cheered and high-fived their American teammates during relay races involving Hula-hoops and balloons. They have taught the American campers cheers in Hindi, their native language. "They are so excited," said their coach Kimberly Miranda, who made the trip from India with the team. "I think they are still trying to settle in, with the language and everything, but this is such a big opportunity for them." Shamila Kohestani, one of the camp's assistant coaches, has made a special connection with the girls. She came to Foudy's camp in 2006 from Afghanistan, Foudy providing her a camp scholarship after hearing about her experience at an ESPN event in 2004. The girls call Kohestani "Didi," which means "elder sister" in Hindi. She understands where they come from. Her family moved from the town where she was born, Kohestan, to Kabul when she was a young girl after the Taliban moved in and her family deemed it unsafe. Kohestani's experience at Foudy's camp led her to attend high school and then college in the United States. She is a senior at Drew University in New Jersey, majoring in political science and women's studies. "If it was not for Julie, I would not be here," Kohestani said. And that is why she has developed such an affinity for the Magic Bus girls. "It is so easy to connect with them because I have been here myself," Kohestani said. "There are a lot of similarities in our cultures. There are no facilities for them to play, there are family pressures." Kohestani has gone into the girls' dorm room in the evenings to spend time with them and talk. "It's made me very happy that they are here," she said. Kohestani went home to Afghanistan earlier this summer for the first time in four years. She said she did not tell many people she was coming home for fear that it would mean trouble for her family now that she's living and studying in the United States. She met a young male friend from school who wanted to have lunch and catch up. She was arrested for being out in public with a man who was not her father or her brother. "It wasn't a date, it was lunch," said Kohestani, who ultimately was freed after her father provided money to local law enforcement authorities to secure her release. "People think things are better for women in my country, and they are worse." Kohestani wants the same kind of change for the girls in Mumbai that she wants for her own countrywomen. When the girls are done with their trip to the Bay Area, which will include hosted trips to San Francisco and San Jose to meet with groups such as the YMCA and the Bay Area Women's Sports Initiative, they will return home to the lives they left behind. One night, the girls stood up in front of their fellow campers and talked about a "typical" day at home. They talked about rising at 5 a.m. to do household chores before school and coming home to more chores. They talked of arranged marriages and the disapproval of playing soccer from friends and neighbors, how family members tell them they are bringing shame to their families by running around in shorts playing a sport meant for boys. They talked about how the government will come in and bulldoze their shanty homes, forcing them to relocate. They talked about wanting to go to college, and educating their parents and communities about the changes they want to bring home. Giles said it was "shocking" to hear about how the girls live. She said some of the American girls cried listening to them. "It was all people talked about the next day," Giles said. Foudy said she would love to work out an exchange program that could send some of her American girls to India. She said she hopes to send the Magic Bus girls home "empowered and confident in their own voice." That may already be happening. "We are going to try to get people to look at the parts of our country that are wrong, to look at the people who are suffering," Shaikh said. "There are small things that we can to do help all of us."